The Upstairs Room is ideal for events and groups that are required to be ‘tucked away’ as it is situated on the first floor of the Centre. It has a wooden bench seat around the perimeter of the room. It is accessed via a stone staircase and therefore might not be suitable for those with mobility restrictions. It is home to the village’s own fiddle group, The Palatine Fiddlers. 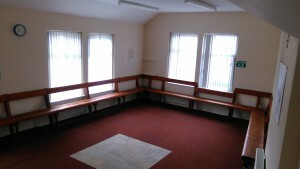 It is also used for practise by other local music groups. The approximate dimensions of the Upstairs Room are 8.5m x 5m. The hire of this room is £10.00 per hour.